*Ms. Brown has posted an update on her recovery to her Go Fund Me Account. Please use the link below to read her statements. Ms. Brown’s friends and family have set up a Go Fund Me account. If you are interested in donating, please click here to access the GoFundMe account for Maureen Brown. 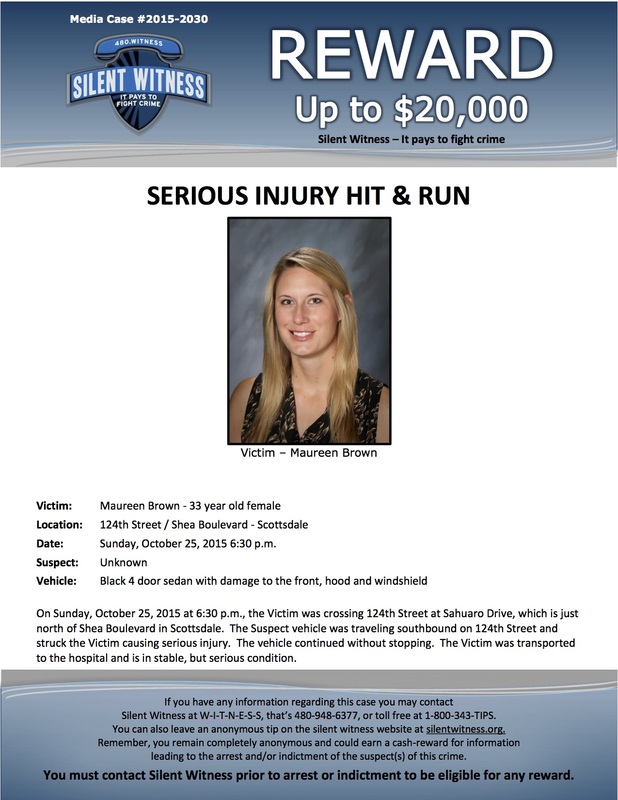 Please consider printing and distributing the attached Silent Witness flyer. Copies of this flyer can be distributed in the Scottsdale community and to local area businesses, restaurants, bars, gas stations, car washes, and, most helpfully – AUTO REPAIR / BODY SHOP / WINDSHIELD REPAIR businesses. These do NOT need to be handed out door-to-door, or hung from light posts or street signs. Please ask local businesses if this can be posted in the window, on the door, or by the cash register. McDowell Mountain Community Church (MMCC) is organizing a call list to have volunteers each contact 2-3 auto body/windshield companies all over the Phoenix Metropolitan area. Hundreds of calls need to be made. If we can secure hundreds of volunteers, each person needs to only call 2-3 businesses…and we can reach thousands of businesses! If you are interested in making just a few calls, please contact Kate Taylor (602) 909-5440 / HenkandKate@aol.com Provide your phone number and email to Kate. She will compile a list of willing faculty and parents and forward that list to MMCC, so you can be assigned a couple of businesses to contact. The APT has delivered a poster of well wishes to the hospital and a basket of magazines and snacks for her family to enjoy while visiting her.